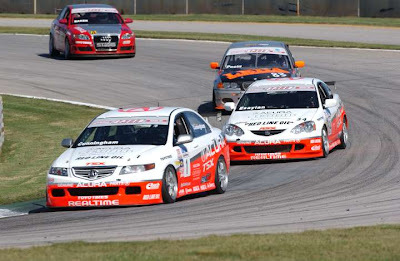 "Acura now holds the distinction of being the winningest manufacturer in the 17-year history of the SCCA Pro Racing World Challenge series, breaking the tie with Honda which owns five. Acura takes an insurmountable 11-point lead over Mazda into the season's final race at Mazda Raceway Laguna Seca in Monterey, California on October 22nd." Your eye's aren't mistaken, that's an Audi and a BMW behind those Acura's. RealTime Racing is currently 10 time World Challenge Champions. "RealTime Racing has been successfully fielding Hondas and Acuras in a variety of motorsports venues since 1987."